← Applying Felt on Box Sides — not just the Bottom! One of the greatest things about working with your hands is that you can always find some new techniques to increase your skill set. In the annual issue of Fine Woodworking’s Tools and Shops (the one that published my scrub plane, shameless plug!) 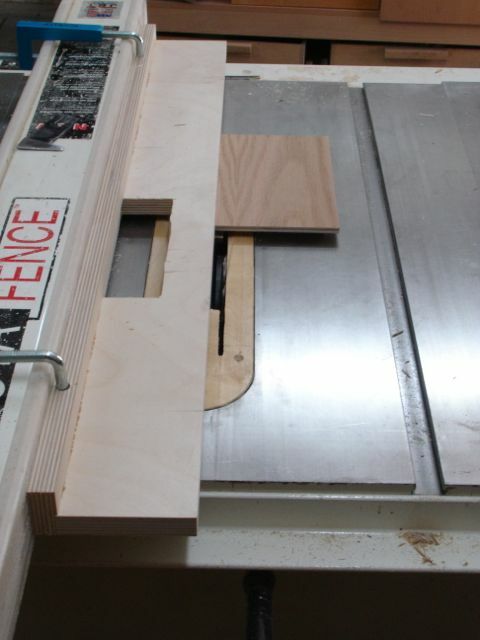 there is an article by Bob Van Dyke featuring the L-Shaped fence for the table saw. Although I’ve seen these in use on rare occasion it wasn’t something I thought I’d need until now. Here is a LINK to the article although you have to be a member of Fine Woodworking on-line to access it. You could buy the Tool and Shop issue or check it out from your local library. There are a number of things you can do with this, easy to make fence. You’ve more than likely used a sacrificial piece on your rip fence when rabbeting a board — this is a way to have a permanent fence that won’t get destroyed. 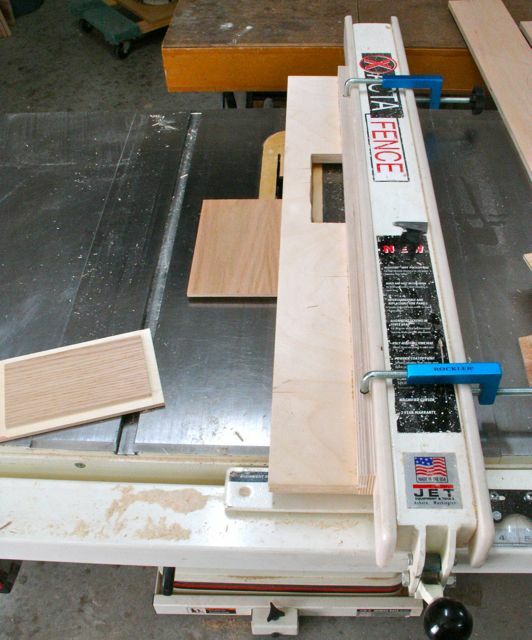 Other uses are for tenons, squaring up a rough edge on a piece of raw stock by using a guide, and template work. I just started a custom Etsy order that needs rabbets cut on the top and bottom pieces so I thought I’d give it a try. This one is made of 3/4″ Baltic Birch plywood. He used F-Clamps that fit into large holes drilled into the fence. Since I have these Rockler fence clamps it was easier to simply drill 3/8″ holes and use them. I cut a slight rabbet on the piece that is clamped to the fence to aid in registering the fence during glue up. Five screws and glue is all that was needed. The area cut over the blade is there so you can safely clear scraps as needed. I found that it also serves as a hand hold when you attach the pieces together. You can see there is a dado head installed which is set for a height of 1/4″. In this photo you can see the underside of the piece that was rabbeted all the way around. It was very easy to cut the rabbets using this L-Fence. The custom order I have is for a plywood box that will be dyed black. My client sent a photo of one from a catalog which is no longer available and asked if I could make it. After some experimentation I think I can and will blog about it as work progresses. It’s an opportunity too for me. There is a series of boxes I’d like to try using tinted shellac on, an experiment that’s been on the back burner until now. I truly wish I could share a project I recently completed but can’t! Here in Las Vegas we have a group called the Sin City Woodworkers. You can click that link to our latest newsletter from Novembers’ meeting. We’ve been in existence for 5 years now so I’d say we’re well established. We meet every third Wednesday of the month and for our annual Christmas party we have a contest. The challenge is to see what you can make with a construction grade 2″ x 4″ x 8′ piece of material purchased from any “big box” store. I just completed my project for the contest but since the projects will be brought in anonymously for voting I can’t share what I’ve made with you at this time. Wish I could though, pretty amazing that it started out as a $3.00 stick of wood! This entry was posted in Uncategorized and tagged Bob Van Dyke, Fine Woodworking Tools & Shop issue Winter 2014, L-Shaped Fence, rabbets, Rip Fence attachment, Sin City Woodworkers. Bookmark the permalink. 1 Response to Always Something to Learn!